Most women aren't born with perfect skin. But, there's a lot you can do to ensure your skin looks its very best. That means washing off all your makeup each night before you go to bed. The question is, though -- are you cleansing your face thoroughly enough? Probably not. In fact, the average woman washes her face for a mere 15 seconds, which isn't enough time to get it squeaky clean. That's where the 60-second face cleansing rule comes into play. And there's a reason why it's making such a splash on the internet. Developed by Nayamka Roberts-Smith of LABeautyologist, an esthetician who has a huge Twitter following, the 60-second face cleansing rule is a method to get better skin by taking the time to really cleanse your skin every morning and night. As you know, it can be super tricky removing unwanted makeup, dirt, and oil from the skin. That's why you want to give your cleanser time to break down and dissolve products and grime. You also want to remember to focus on cleaning the edges of your nose, under your chin, and around your hairline. The 60-second rule allows you to do just that. The answer? Possibly. Dermatologists agree that following the 60-second rule can give you brighter, softer skin as long as you use the right cleanser since it stimulates circulation. If you usually wake up with mascara or eyeliner under your eyes, you're not cleansing your skin well enough. 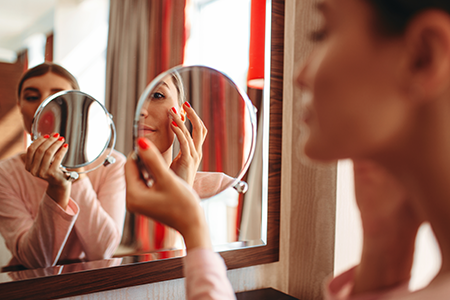 Left-on makeup can lead to dryness, irritation, and breakouts. The 60-second rule can help improve the quality of your skin by simply getting it clean. The verdict? There's no harm in trying out the 60-second face cleansing rule. "Can Washing Your Face for a Full 60 Seconds Give You Perfect Skin? I Tried It," Cosmopolitan, January 9, 2019. "The Viral 60-Second Rule Proves You've Probably Been Washing Your Face All Wrong," Prevention, January 22, 2019.